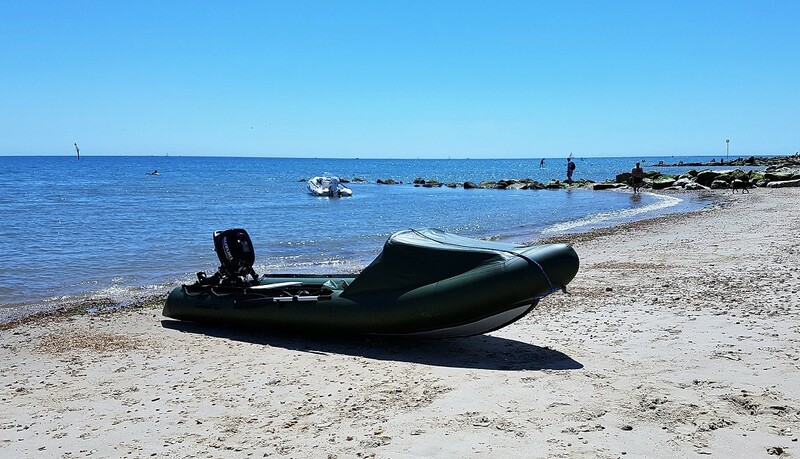 SpearFish Boats are relatively long and narrow roll-up inflatables. Their unique shape makes them very easily-driven, which means you can achieve decent speeds with relatively small (lightweight and inexpensive) outboard motors. 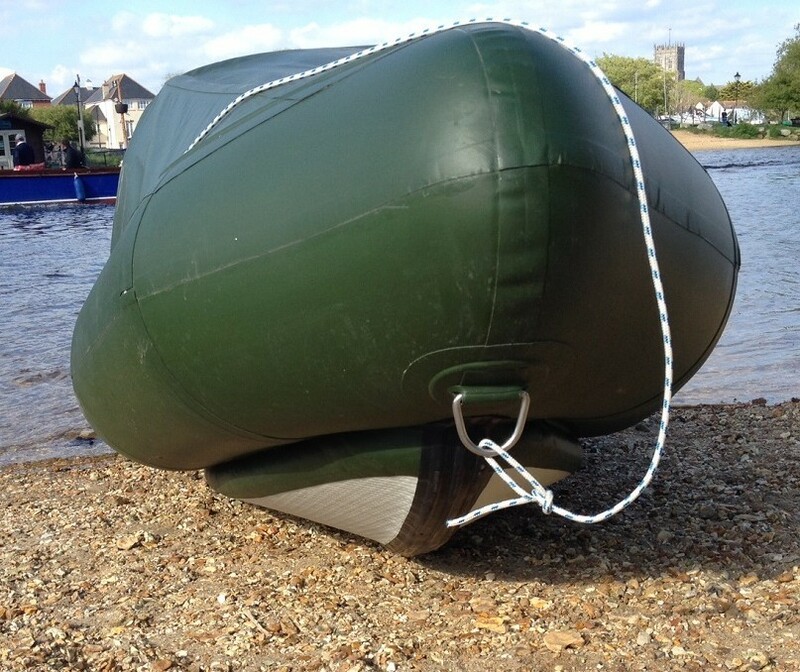 And because the deflated boats fit in a bag (that fits in most car boots), you won’t need a trailer or mooring. 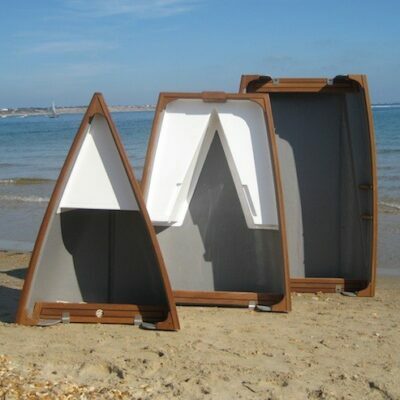 This all makes for a highly portable, and refreshingly affordable, means to get afloat. 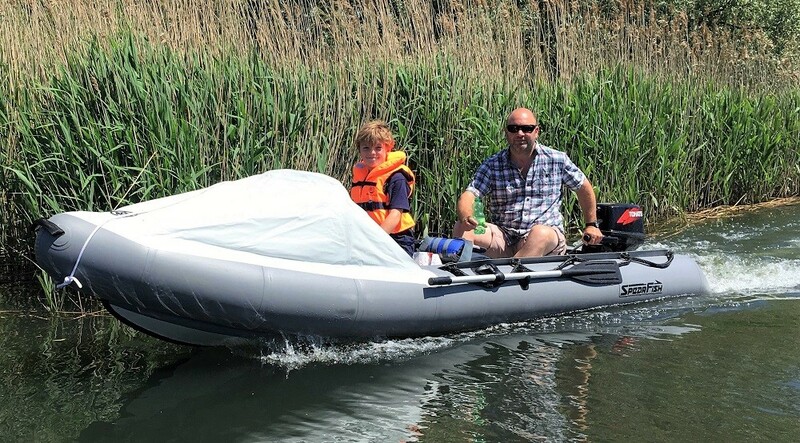 For example, with a 6hp motor the smallest 450 (15ft) model will do 14-15 knots with two adults on board, when a typical-shape inflatable dinghy would be languishing in single figures. 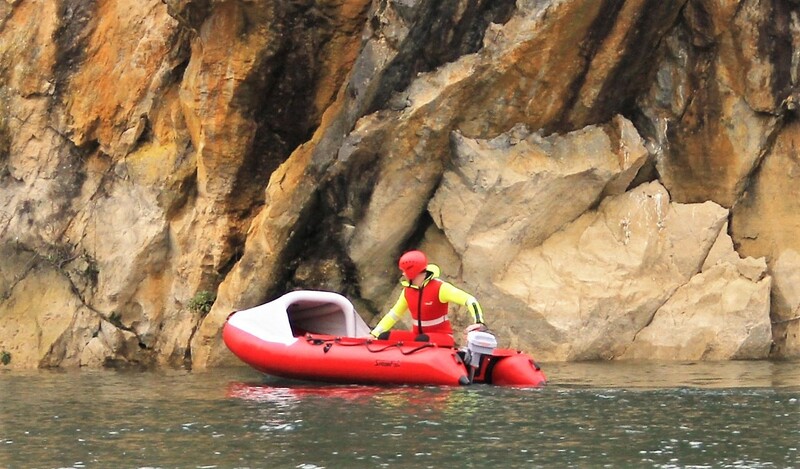 The ride is also remarkably comfortable – she slices through the tops of waves, rather than bouncing over them. And the stability is also very good, because as soon as she heels a few degrees.there is an immense amount of “push back” from those long (4.5m long) side tubes. 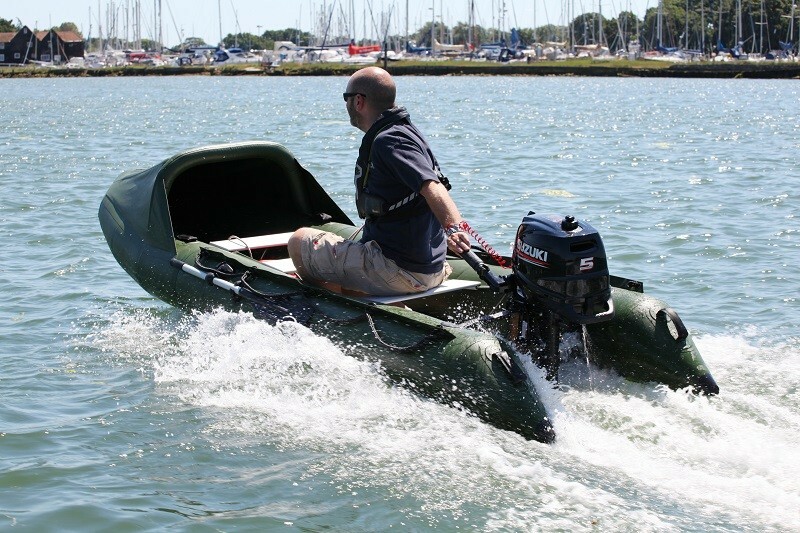 “If you need a portable boat, you need a portable engine too“. 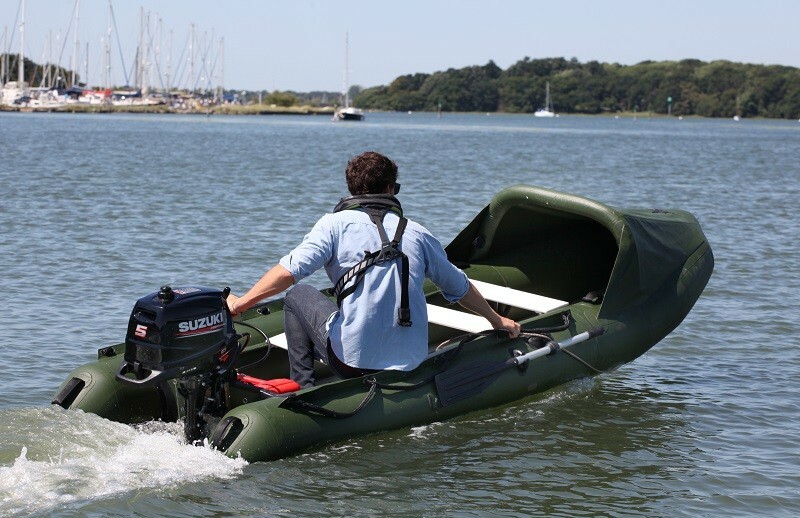 Outboard motors up to 6hp are a comfortable one-person lift (13-27kg); 8 & 10hp motors are just about manageable (lightest is 37kg). 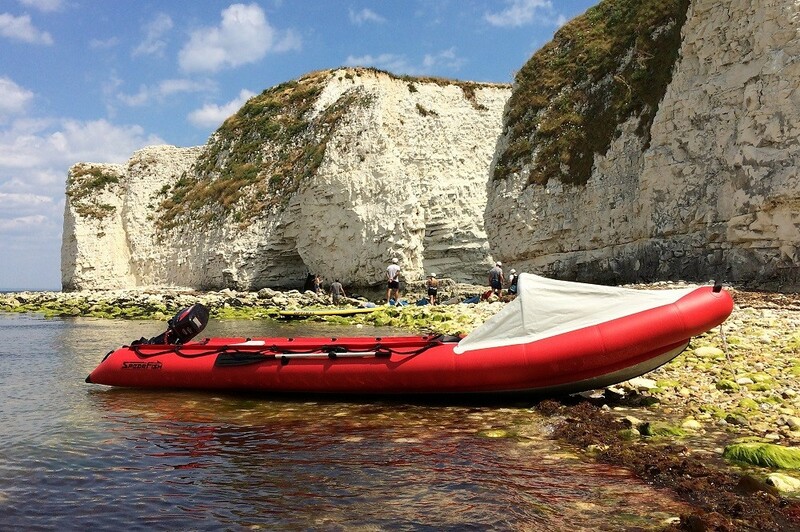 We’ll say it again: the SpearFish 15 will reach speeds of 12-15 knots with two adults on board, on just 6hp. 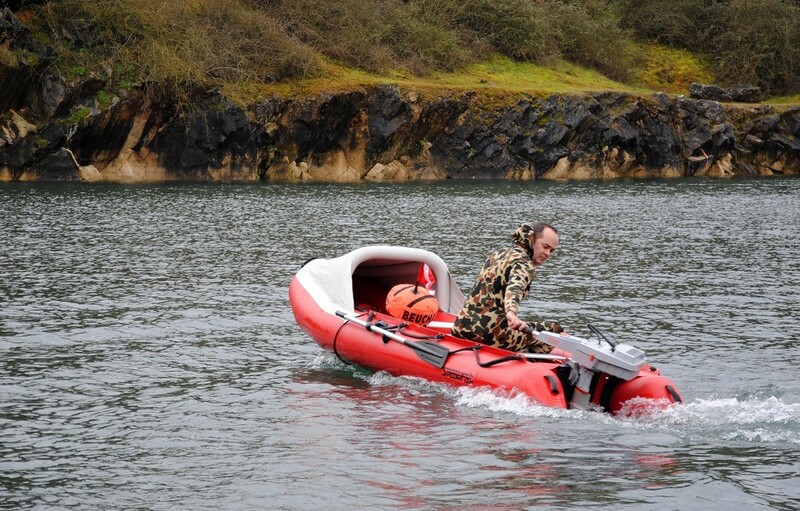 Very few other boats can do that, let alone roll-up inflatables (we can’t think of any). And of course it’s even faster if you’re boating solo. 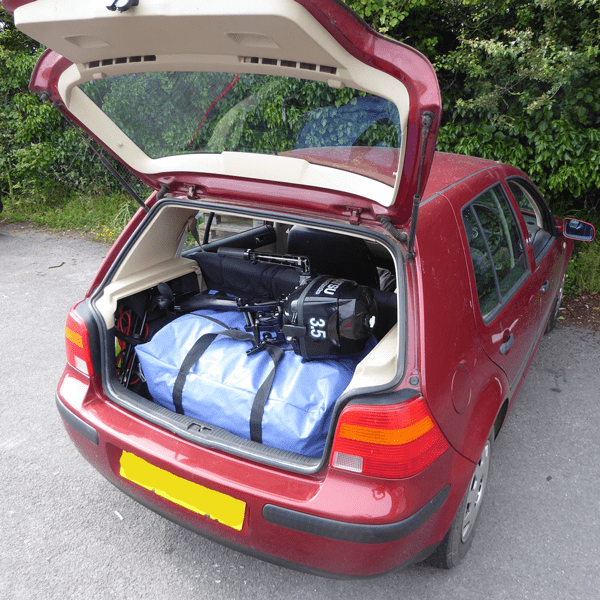 Here we can see the folded SpearFish fitting comfortably in the boot of a VW Golf hatchback – with the rear seats still up. 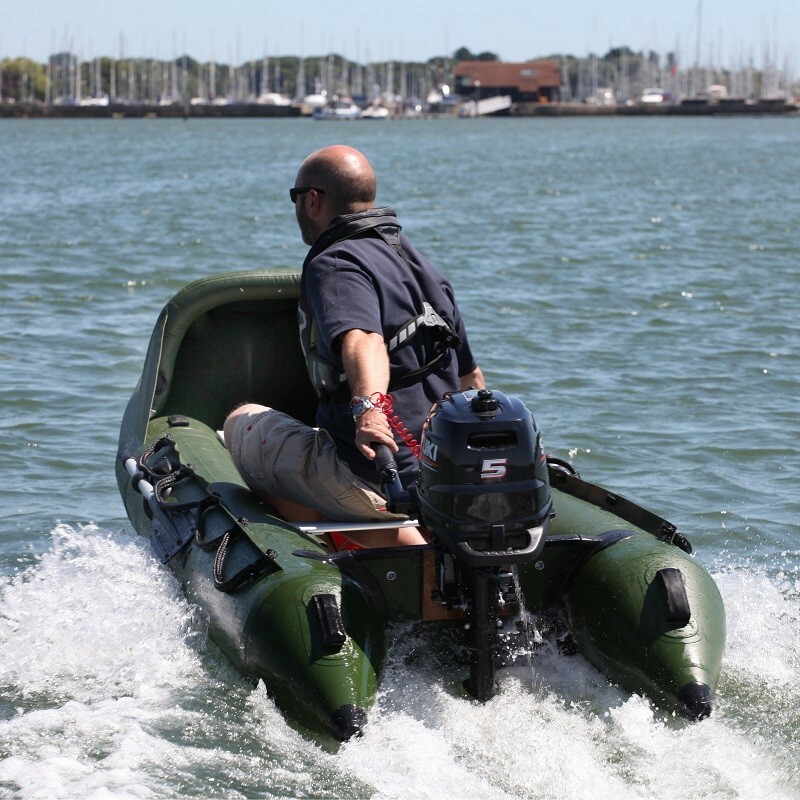 A small outboard (in this case a Tohatsu 3.5hp) will also fit on top. This then is a complete boating package for all the family, that fits in a family hatchback, with room for the family too. 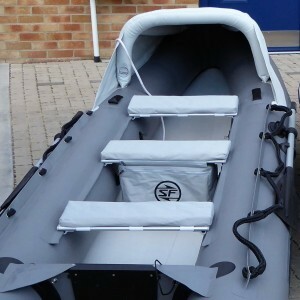 Standard specification includes: tubes made from German-made Valmex multi-layer fabric; high pressure drop-stitch lower hull with V-shape at bow; integral inflatable bow canopy; stirrup inflation pump; pair of oars/rowlocks; lifelines all round; strong towing/mooring eye and lifting handles; outboard bracket. 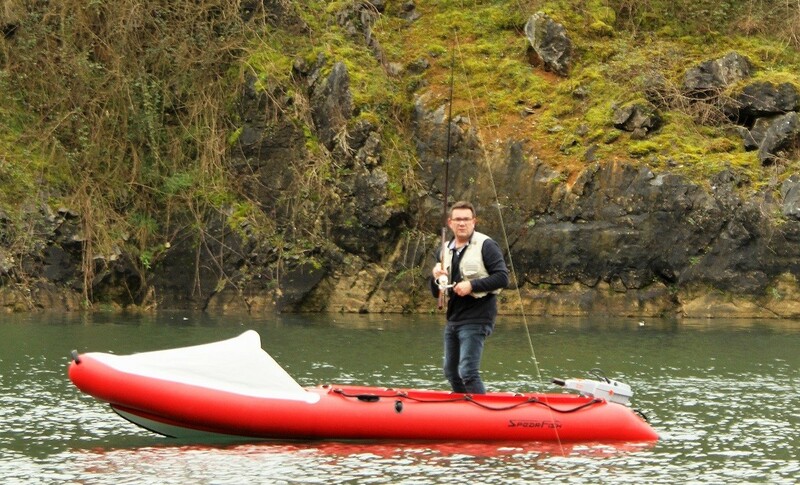 BELOW: Perfect for a spot of fishing… and plenty of stability to stand up and cast. The “official” capacity rating is 3 adults, or 2 and 2 children. 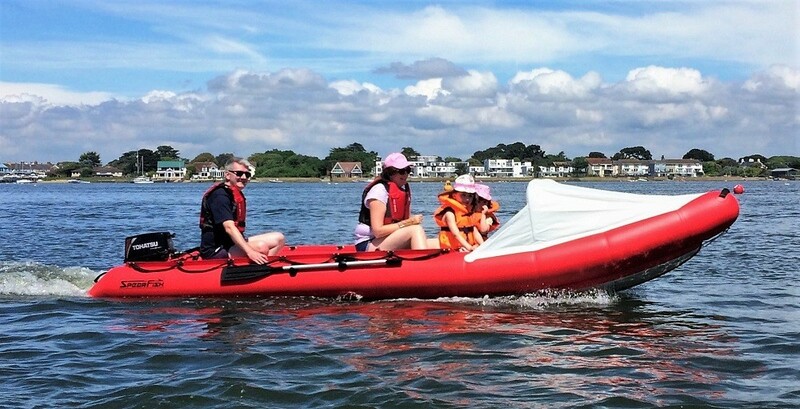 But if the children are small, and if like here it’s a river trip on a calm day… more is probably fine! 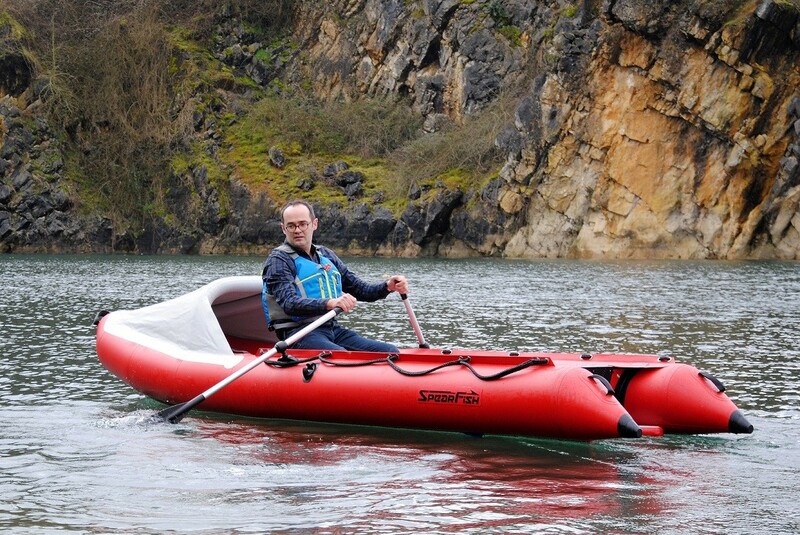 The maximum weight capacity – people, engine, stuff – is 450kg and even that’s quite conservative. Man and SpearFish exploring the coastline, close in to the cliffs. SpearFish, with her low drag hull, is almost certainly one of the best inflatable rowing boats ever built. Shown here with a single paddler, the balance is even better with a tilted outboard – or a second person – at the stern. 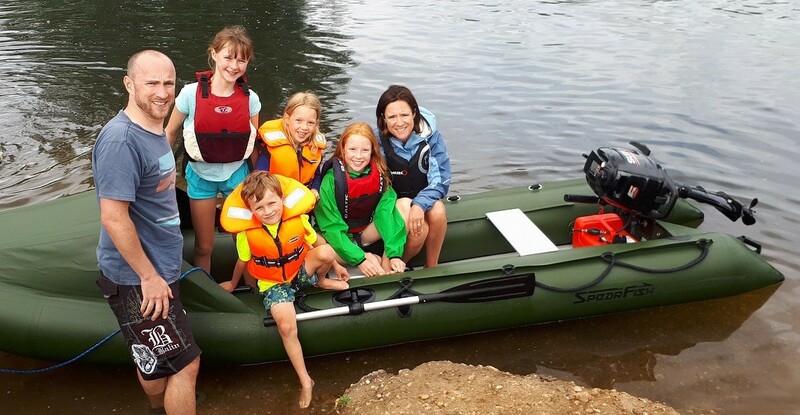 As several divers have observed, SpearFish would make a fine support vessel and – particularly if you have a red one – doubles up as an unmissable surface marker.